Dr. Yingbin Liang received the Ph.D. degree in Electrical Engineering from the University of Illinois at Urbana-Champaign in 2005. In 2005-2007, she was working as a postdoctoral research associate at Princeton University. 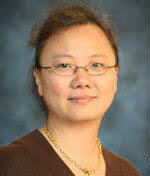 In 2008-2009, she was an assistant professor at the Department of Electrical Engineering at the University of Hawaii. In 2010-2017, she was a faculty member at Department of Electrical Engineering and Computer Science at the Syracuse University. Since August 2017, she has been an associate professor at the Department of Electrical and Computer Engineering at the Ohio State University. Dr. Liang’s research interests include machine learning, statistical learning theory, high dimensional data analysis, parallel and distributed optimization, information theory, and wireless networks.